The state of Florida has a bounty out on invasive pythons, luring amateur snake killers into the Everglades for a month-long hunt. Hilarious, right? Not to those who say it encourages cruelty and does little to solve conservation problems. Officials with Florida's Fish and Wildlife Conservation Commission (FWCC) say the 2013 Python Challenge is meant to raise awareness about the invasive species. Floridians have a fondness for pet snakes, but many don't realize just how huge Burmese Pythons get to be. So when these slithery monsters get released into the wild, they wreak havoc on the indigenous wildlife in the state's Everglades National Park. The purpose of the Python Challenge, according to the event's website, "is to raise public awareness about Burmese pythons and how this invasive species is a threat to the Everglades ecosystem." Around 1,300 snake hunters have signed up and completed the two-minute online training course required to participate. The person who snares the most pythons gets $1,500; the longest catch earns $1,000. Hunters have been told to bring the snakes in dead—live specimens won't get them any prizes. FWCC organizers are advising hunters to kill pythons by shooting them right in the brain with a captive blot gun, No Country for Old Men-style. Because the snakes blend in with the yellowish, brownish brush here, they are almost as hard to find as a Glenn Beck fan on the Upper West Side of Manhattan. It's a perfect regional story, full of swampy Southern quirk. 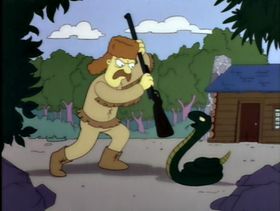 Heck, even Florida Senator Bill Nelson is getting in on the snake-bashing action, standing in for Mayor Quimby in this real-life rendition of "Whacking Day." No one believes Burmese pythons in Florida can be eradicated. The pythons are here to stay. They are part of Florida now. How we treat these animals at our periphery says a lot about how we will treat life more dear to us. Christy talked about the hunt with University of Florida wildlife ecology professor Frank Mazzotti, who argues that if this is a conservation effort, it's a misguided one. "They're the poster child for invasive species," Mazzotti says. He notes the Cuban tree frog is a bigger problem for Florida ecosystems, but try selling a war on cute little frogs to the public. "It sounds cynical, but it's true." Plus, the results of the hunt have made just a tiny dent on the Burmese Python population in Florida. Out of 150,000 snakes, only 27 have been assassinated so far. And many locals are squeamish about the danger involved when a posse of minimally trained snake hunters are given license to kill pythons by any means necessary. Florida-based writer Dave Barry (let's say he's Milhouse) told NPR's Audie Cornish, "I'm not going anywhere near the field, personally. The field is full of people who have come from other states to try to kill large non-native snakes with guns ... I think there's going to be a lot of just shooting going on out there." Scott Wisneski, a reptile pet store owner in Central Florida, told The Daily Beast's Eliza Shapiro that the Python Challenge seems too much like mob violence: "It’s like saying, 'it's open season! Get your pitchfork and your torches and go get them!'"